Driving to Sun Peaks Resort - Beautiful and increasingly popular, Sun Peaks is the closest resort in the interior of British Columbia from the Lower Mainland. And once at Sun Peaks Resort, everything is so close by – park your car at your Sun Peaks accommodation, and you probably won’t need it during your Sun Peaks vacation until the holiday is over and it is time to return home. There are a number of Sun Peaks shuttle bus services available to get you from Kamloops upto the resort, and once in the resort, there is a free Sun Peaks shuttle bus during the main ski season (Dec-Mar). Click for a PDF of the Driving to Sun Peaks map (courtesy Sun Peaks Resort). Click for up-to-date Coquihalla Highway webcams and road conditions for Driving to Sun Peaks Resort. The snow has begun to settle on the peaks of Tod Mountain, Mt. Morrissey and Sundance Mountain and also on the Coquihalla and other mountain passes to the interior, and the excitement is building as the 2014/15 ski season quickly approaches. - No matter the season, always be aware of the road and weather conditions, plan ahead and be prepared. - Make sure your car has proper tires with good tread, and possibly consider having chains in the trunk. During the period October 1 through April 30, winter tires with the mountain snowflake logo or M+S tires with a tread depth of at least 3.5mm all over can be used. - Fill your windshield washer bottle and ensure your headlights and tail lights are all working – and turn them on! Don’t just rely on your daytime running lights. - There are no gas stations on the Coquihalla so ensure your car has a full tank of gas before you begin. Fill up in Hope/Merritt before heading over. You never know when a breakdown or accident will leave you stranded for prolonged periods and you will want to keep warm. - Be prepared with warm clothes, gloves, hats and blankets, flashlights, and candles, as well as some food and water. 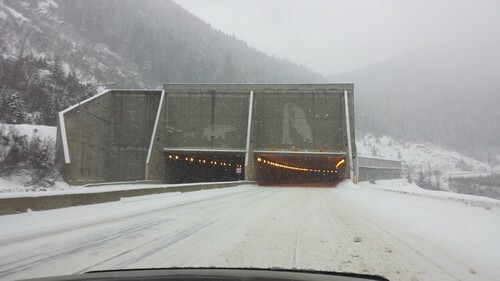 - Check the DriveBC website for road conditions and webcams before you leave, and tune into the posted travel or local area radio stations when available. - Ensure your cell phones are fully charged. - Let others know your travel time and expected arrival time, and make plans for when/how to follow up on late arrivals. Your GPS or Smartphone device may suggest an alternative dirt back-road route off of Highway 1 near Pritchard, BC, and Chase, BC. This route is not recommended for winter travel. The best, easiest, and most direct route for driving to Sun Peaks Resort is via Highway 5 North, exiting at Tod Mountain Road by Heffley Creek, BC. 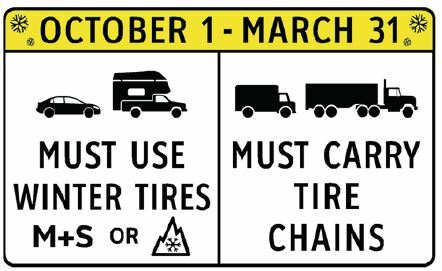 Snow tires or chains are mandatory from October 1 to April 30 each year. And if you are driving up to Sun Peaks Resort from the USA, please remember you will need your passport to enter Canada. • Your trip will take around 3.5 – 4.5 hours, depending on your point of departure, travel conditions, the time of day and day of the week, etc. • Please remember you will be driving through high-altitude and weather conditions that are subject to sudden changes, and of course winter driving conditions during ski season. Ensure your vehicle is properly equipped with snow tires and/or chains, and adapt to your driving conditions no matter the season! • We also suggest ensuring you always have plenty of gas for driving to Sun Peaks Resort – have enough before you leave the Lower Mainland, and fill-up in Hope or Merritt along the way. Gas may be cheaper out in the Fraser Valley as well – Chilliwack, Abbotsford, etc. • After around 15 km/9 miles, you will see a Petro-Canada gas station on your left. This gas station and a small one at the Heffley General Store (up ahead) are the closest to the resort. There is NOT a gas station at Sun Peaks Resort. 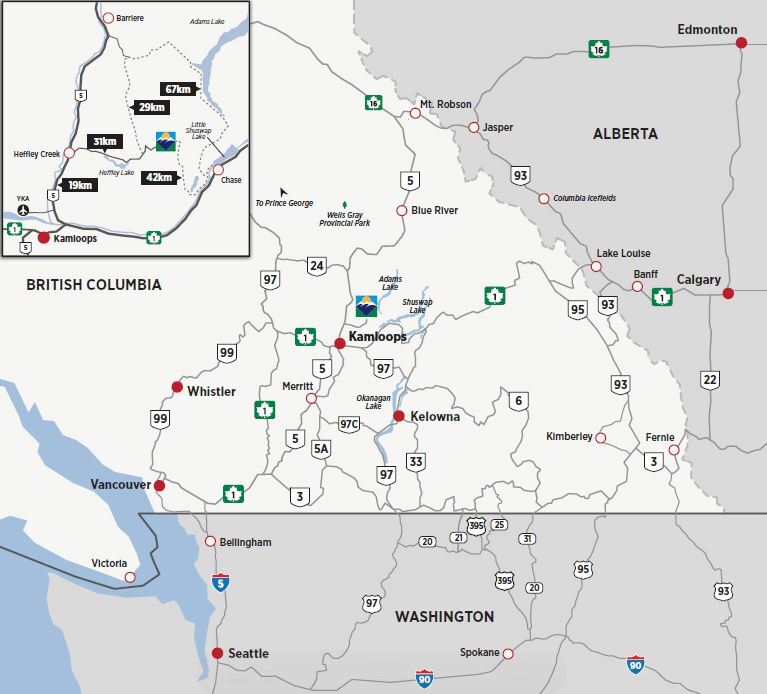 • After another 8 or 9 km/5 miles, you will see a turnoff from Highway #5 to Sun Peaks Resort area, and very shortly after you will have to turn left at the Heffley General Store to go up Tod Mtn. Road. 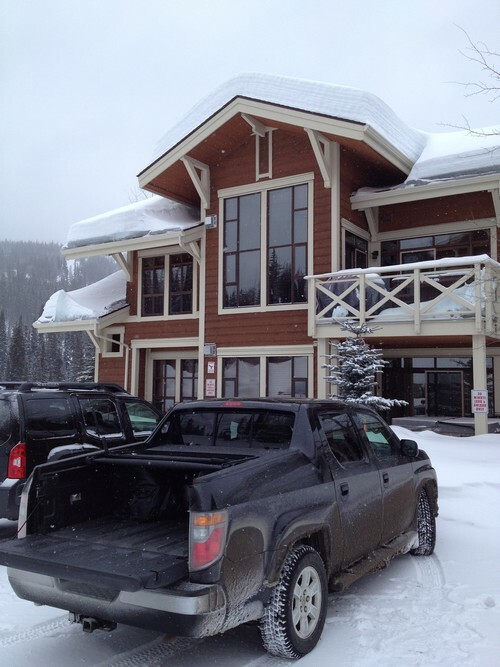 • Continue driving to Sun Peaks Resort for approximately 32 km/20 miles to Sun Peaks. If you want to have some fun or take a break along the way, consider stopping in at one of the new Kamloops wineries (but drink responsibly) or stop and enjoy the short walk to the Sun Peaks Waterfall which is about ½ way up the hill. You are here - Sun Peaks Resort! Shortly after entering the resort area and passing the Welcome to Sun Peaks Resort sign, you may notice the name change from Tod Mtn. Road to Creekside Way. The day lodge and main day parking area closest to the village is on your left, and if you carry on driving in behind the village, you will come to a ‘T’ intersection, with the Remax office and Kookaburra Lodge on the right, and the community Sports Centre (with pool, hot tub, and tennis courts) straight ahead. 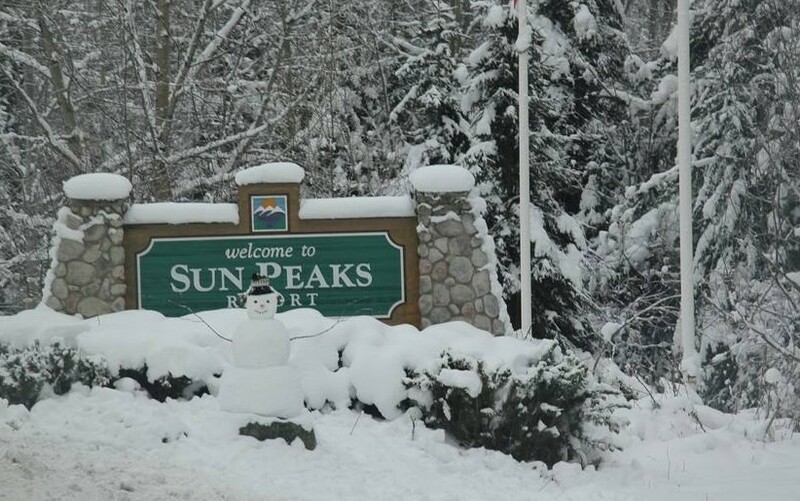 • From here, follow along the directions you would have received to your Sun Peaks Vacation rental or Sun Peaks Hotel, park your car, and have a wonderful time!! • If you are staying at our Best Sun Peaks condo, turn right at the 'T', carry on past the townhouse complexes (or stop at our Trapper's Landing townhouse), past the Morrisey Express chairlift which will be on your right, over the Morrisey Connector, and the first (beautiful) complex on your left is Stone's Throw which is where your Best Sun Peaks rental condo is. Pull into one of our two secure, underground parking spots or pull into one of the above ground temporary loading/unloading zones (pictured on the right) and begin your holiday - we hope you love it here as much as we do!? If you happen to be towing your trailer or driving to Sun Peaks Resort in your RV, there are a few Sun Peaks camping options.